The true story of the Granite Mountain Hot Shot firefighters from Prescott, AZ. Movies based on true stories can give much-needed depth to stories people are already familiar with, or they shed new light on unheralded heroes who haven't received their due. "Only the Brave" manages to do a little bit of both, at least for us. We didn't know anything about the Granite Mountain Hot Shots or their story going into the film, so it was all new information to us. For those that do know their story, we're sure this film will help add a little insight into the day to day lives of the people in this group, though there is obviously a little Hollywood flair added for dramatic effect. The film is directed by Jeff Kosinski and is written by Ken Nolan and Eric Warren Singer based on the GQ article "No Exit" by Sean Flynn. It tells the story of the Granite Mountain Hot Shots, the first municipal wildfire-fighting Hot Shot team in the country. Even though the story is mainly about the group as a whole, the focus of the story is on two characters: Eric Marsh, played by Josh Brolin, and Brendan McDonough, played by Miles Teller. Eric Marsh runs the show as the team's "supe." He is married to Amanda, played by Jennifer Connelly, and much of the film is focused on their relationship and the dramas that come with marrying a firefighter who spends 90% of his time away from home. Brendan is the new rookie of the group who prior to joining them had problems with drugs and crime. He is now looking to turn his life around, and since he just became a father, wants to do right by his daughter. As mentioned above, we knew nothing about this crew or their exploits going into the film. We do think it aided in our enjoyment. Since we didn't know where the whole story was going, we were surprised at every turn. If you don't know the story, we suggest you go in knowing as little as possible for maximum effect. Though the focus remains on Eric and Brendan's characters, "Only the Brave" also takes the time to get to know many of the people involved in the Granite Mountain Hot Shots team as individuals. This helps the audience relate to these people on a more personal level. Furthermore, it explores the familial aspects of being part of a group like this, how the wives of the firefighters band together when someone needs help, how the men are friends outside of work in addition to working together on the front lines, etc. The film has a great cast, and the actors put on an excellent performance. Josh Brolin, Miles Teller, and Jennifer Connelly have the most prominent, weighty parts, but Jeff Bridges, who has a much smaller supporting role, does a fantastic job as well. We were deeply engaged by the story and by the people and the characters. This story is one of comradery, brotherhood, bravery, and family. It's not all drama, however. There are some moments of sheer intensity as fires bear down on the Hot Shots, but this isn't the kind of story that tries to sensationalize these moments. Kosinski handles them in a fairly honest manner with realistic effects to back them up. The one big flaw of "Only the Brave" is it does have a few moments that drag on and on. Many of the domestic squabbles get a bit overemphasized, and we could have done without two or three of the fight scenes, particularly between Eric and Amanda. It is a bit too long, though this is a double-edged sword of sorts. It needs its length to help the audience care for and identify with these individuals and their group, but it also could have been trimmed down about 10-15 minutes. Other than that, we really enjoyed this harrowing movie, and we are glad we're now aware of the Granite Mountain Hot Shots. Really well done! **Did you know we have a podcast? 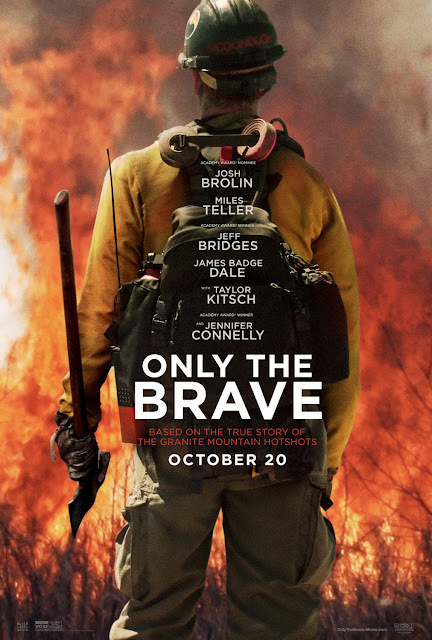 Check out the episode where we discuss "Only the Brave" right here! Our review starts at 24:18!